The reasons for cyclic fluctuations of small rodent populations have been - and still are - intensely discussed among ecologists. 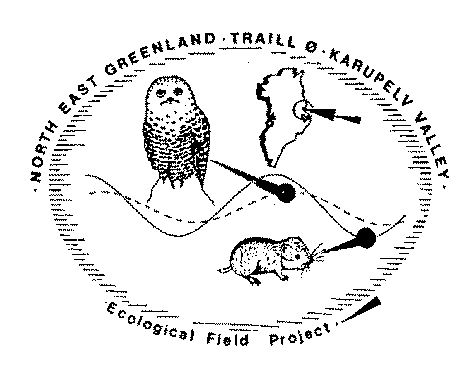 The questions relating to the driving factors behind these remarkable fluctuations have been addressed in the scope of Karupelv Valley Project since 1988 in a long term study of lemming cycles. The project is jointly carried out under the auspices of the chair for Landscape Management of the UniversityFreiburg (GER) as well as of the GREA. The high Arctic tundra in the Karupelv Valley (72.30 N; 24 W) in North East Greenland serves as the study area for our investigations and features one of the most simplified terrestrial animal communities offering ideal conditions to explore basic ecological interactions. The approaches adopted here include the assessment of lemming population dynamics as well as those of its predators. The fluctuations of lemming populations have been monitored since 1988 through systematic recordings of winter nests in a study area of 1500 ha in size. Winter nestsare easy to detect and count during and after snowmelt. 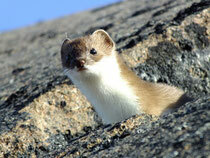 The study of uncovered lemmings nests in the Arctic summer also allows to track back predation by stoats in winter since nests eliminated by stoats are characterized by the remainders of a typical, ‘sleeping bag like’ fur lining. Apart from stoats, other predators such as snowy owls, long tailed skuas and arctic foxes are recorded. Especially avian predators and foxes are easy to monitor by annual assessments of their breeding success or occupation of dens respectively. In addition, the sampling of pellets and scats provides detailed information on predators’ diets. Apart from the above mentioned general research objectives and approaches, there are also more detailed aspects that are repeatedly addressed within the scope of Karupelv Valley Project. 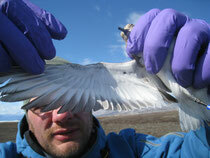 For example radio-telemetry of foxes and satellite telemetry of snowy owls as well as skuas. As shown in the diagram featuring the observed population fluctuations since 1988, lemming populations first displayed the typical pronounced cycling patterns with recurrent and quite severe irruptions every 4 to 5 years. Based on modeling approaches, these fluctuations could be attributed to the delayed density response of stoats, supporting the hypothesis of specialised predation being the driving factor behind the distinctive population cycles in lemmings (Gilg-Hanski-Sittler / Science 302 - 2003). The changes that became apparent within the past decade suggest a fading or even levelling of these cycles and may be related to effects of global change. Simulations of lemming population development which take into account changes in snow cover seem to support this theory (Global Change Biology 15 - 2009). 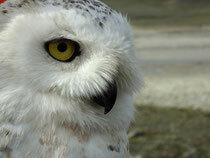 The missing cyclical outbreaks of lemming populations also affect the reproduction rates of its predators, as shown by the breeding success of snowy owls during the past decade. Our observations suggest a dramatic decrease of the reproductive output in the study site. Similar observations also apply for long-tailed Skuas. The results of research activities within the scope of the Karupelv Valley Project show, that long term observations are absolutely indispensable for the detection and correct interpretation of fundamental changes within this fragile ecosystem. In the face of its direct effects becoming ever more visible in the study area, climate change has become a main research objective within the project during the past couple of years. 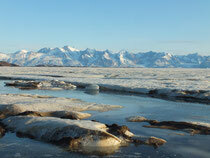 In this regard, special attention has been drawn to the assessment of changes in snow cover of the tundra as well as the patterns displayed by sea-ice cover in coastal areas. Thelatter constitute sever habitat changes for polar bears who become increasingly dependent on foraging ashore during the Arctic summer. In the scope of the project, we apply remote sensing to assess changes in snow cover with data going as far back as the early eighties. A couple of ancillary and follow up projects also contribute to a better understanding of the environmental changes affecting this region. These include the sampling of aerosols through the deployment of so called “Passive Sigma Samplers” in cooperation with the German Weather Service as well as dendro-chronological approaches on dwarf shrubs and drift wood which is carried out in cooperation with the Institut für Waldwachstum Univ. Freiburg and WSL Zürich. 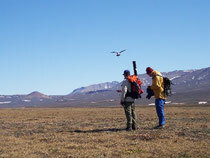 Further, the project is part of a joint Interaction Project shared with Zackenberg station and Hochstetter Project (GREA/ Ecopolaris) that focusses on waders and skuasand includes s various tracking methods such as color ringing and the use of geolocators.